The Arabic, Greek and Portuguese names given are not official. Activate only by removing 8 of your Speed Counters. Destroys all monsters on the field. 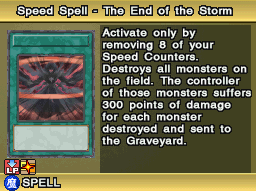 The controller of those monsters suffers 300 points of damage for each monster destroyed and sent to the Graveyard. This page was last edited on 12 August 2018, at 16:53.